Summer classes are beginning soon and for ELL students this can be a key time to catch up or get a jump start on reaching their English language proficiency goals or their school’s goals. ELLoquence makes it easy for teachers to lead students to the next level of English skill with a fast paced, flexible, customized program packaged specifically to meet teacher’s needs and time frame for summer. Summer means longer class periods in a shorter amount of time. This can be a challenge, but also a benefit for students as they grow their skills quicker than they would in a normal school semester. ELLoquence keeps teachers and students focused and on track with a structured academic plan that also keeps student interest during those long periods. Longer summer classes also give teachers the opportunity to include more interactive activities to better practice speaking and listening, while allowing time for individual feedback to target specific student needs. ELLoquence comes with six hours of professional development with a customized package. Teachers also receive lesson plans to keep them on track, a teacher mentor to assist with any technical questions, and a weekly check in with an ESL Specialist. ELLoquence lessons can be custom packaged for summer classes spanning anywhere from three to ten weeks to perfectly match any summer school duration! Packages allow specific units to be chosen based on the interests and skill level of students. ELLoquence’s teacher mentors can also help teachers break down the unit into lesson plans that match the length of class periods to help teachers plan out their whole block of time with students. Our units are theme-based, allowing students to learn English while reading about other academic topics, such as science and history. By teaching students English proficiency through content of academic themes and vocabulary, we better prepare them for the rest of their classes and their academic career. Themes include: world landmarks, environmental science, popular authors, American culture, American History, World History, Economics, Biology, Physics, Chemistry, and Physiology. All of this is using content as a vehicle to teach English. Therefore, teachers do not need to be Science or History experts. 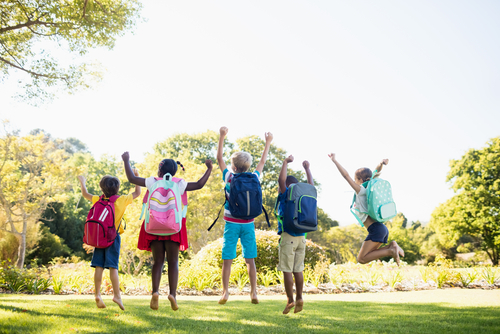 ELLoquence gives schools the flexibility to structure and customize ELLoquence’s summer program to meet their needs regardless of classroom format. ELLoquence works with push-in: having ELL students work on English assignments in their other classes, pull-out: ELL students being pulled out of their classes for short periods of time to work on English assignments, and in a blended format where the teacher can interact with students, facilitating and coaching as well as letting the instruction be led by the technology. ELLoquence also structures lessons to better serve teachers with multi-level ELL classrooms. For these classrooms with students of differing skill levels, ELLoquence lessons can be taught in a blended or independent study format. Summer classes provide increased one on one time between teachers and students. ELLoquence encourages teachers to increase conversations with individual students during this time to not only better their English skills, but to build relationships. The better one gets to know their students the better they’ll be able to pick units and assignments their students will be interested in. Individual focus also allows the students more opportunities to ask questions and get help in the areas they need. Grammar is another key area teachers can focus on with individual students through writer’s workshops. Students can be given feedback individually on their errors and how to improve their writing. Summer is the ideal time for ELL students to narrow the gap between their skill levels and make the next school year a little easier. Teachers provide the knowledge and encouragement the students need. ELLoquence provides the tools.